Pinecam.com • View topic - Road construction on 67??? Post subject: Road construction on 67??? 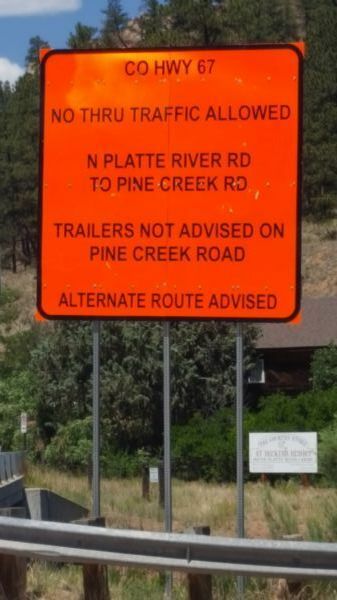 I have called CDOT and Jeffco and no one seems to know what the big orange signs in Deckers and Buffalo Creek say. I have always had someone behind me when I go by so I have no idea what they say. I am trying to find out if any roads are closed. I need to get from Sedalia to Deckers via 67. Does anyone know if it is open all the way through? Thx!!! Post subject: Re: Road construction on 67??? From CDOT web page http://www.cotrip.org/map.htm#/roadWork, clicking on "CO 67" in the "Filter By" dropdown: Paving operations, Woodland Park to Westcreek through June 2018 (!) ... no lane closures today. I am looking for info. on the dirt road portion between Sedalia and Deckers. Does anyone know if something is happening there? Thx! That section of road is being graded and paved with drainage installed. It is part of the Chatfield Reservoir expansion project to handle run-off that gets into the reservoir. The detour route is West Pine Creek Road, the very steep dirt road that goes from North Platte River Road (Highway 97) to Highway 67. That road has a warning posted that it is not for trailers (due to the steep incline and tight curves). The official notice from Douglas County said: "...Temporary road closure of South County Highway 67 (Sugar Creek Road) until August 28, 2018. The Chatfield Reservoir Mitigation Company has contracted with Ames Construction, Inc. and their Contractor has detour – signage implemented. "The temporary closure of South County Highway 67 (Sugar Creek Road) at the intersection of South Platte River Road (County Road 97) to the wye intersection of South County Highway 67 (Sugar Creek Road) and Pine Creek Road and rerouting of traffic in accordance with the foregoing detour plan is necessary for traffic safety and for the protection of work crews and road equipment." I'm glad you brought this up. The sign was very confusing. My confusion was because the sign was placed for drivers going towards Buffalo Creek. My husband was just as confused about it. We didn't know where Pine Creek Road was down there, but still decided to head towards Buffalo Creek and see how far we could go before we hit construction.